A BEA report on Neil Gaiman’s Saturday morning appearance, with details on his new novels, Jack Benny, and the HBO adaption of American Gods. There aren’t many authors who can make a largely female crowd gasp and swoon with every dulcet word, but Neil Gaiman is definitely one of them. Ostensibly at BEA to deliver an address on why storytelling is dangerous, Gaiman’s Saturday morning talk was more about toeing the line and promoting the Gaiman brand. He tossed off e-cards into the crowd like a guitar god cheerfully throwing picks. And he did manage to win over a few skeptics (including this reporter). “So this morning I got here and I signed 1000 books,” said Gaiman at the start, which was followed by ribald applause. “Each of you gets two books.” One of the books was Make Good Art, which will be published in December. He was dressed all in black and settled into his chair with a confident and carefully rehearsed ease. The adult book is The Ocean at the End of the Lane, which was partially inspired by a friend down on his luck who stole Gaiman’s famiily Mini, drove it down to the end of the lane, and committed suicide. It involves the Hempstocks, who have figured in Stardust and The Graveyard Book, but was a long time in coming. 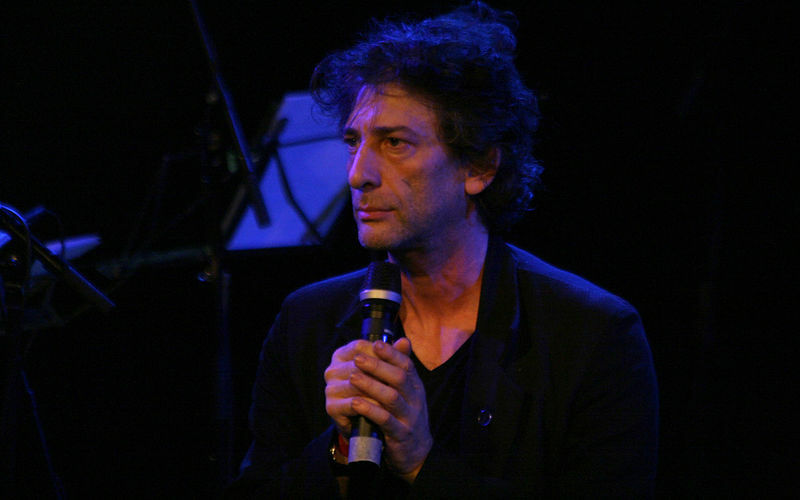 After offering these biographical exemplars, Gaiman shifted to his views about fiction. As Gaiman described his early writing development, there was a curious pecuniary fixation. He had taped an inspirational Muddy Waters quote next to his typewriter: “Don’t let your mouth write no checks that your tail can’t cash.” He talked of an early teacher who had offered him ten shillings to read the entirety of Gone with the Wind. In other words, Gaiman is well-practiced at working the room. Gaiman mentioned that the Ameican Gods TV show is still in development at HBO. He has finished a script and he’s waiting to hear back for notes. He compared the relationship to “a game of tennis,” leading this reporter to wonder if there was a dependable racket that didn’t involve thrones. Gaiman talked about introducing material that had never appeared in the book. He did talk about his affinity for Jack Benny’s old radio program. “They get good around 1942,” after Benny had gone through three sets of writers. He mentioned starting a story about Jack Benny, but, tellingly, he did not mention Fred Allen. There wasn’t much elaboration on Gaiman’s “Make Good Art” speech. This was an appearance to please the crowds. But the very minute that his hour expired, he was led out the door by his handlers, walking with the pace of a rock star with a hectic schedule.